Similar to how the Earth revolves around the sun, the moon orbits the Earth. But it has an elliptical orbit so it’s not a constant distance away. And if you took an average distance, the moon is approximately 238,855 miles (384,400 km) away from the Earth. In other words, the moon varies between 225,622 miles and 252,088 miles due to its elliptical orbit. 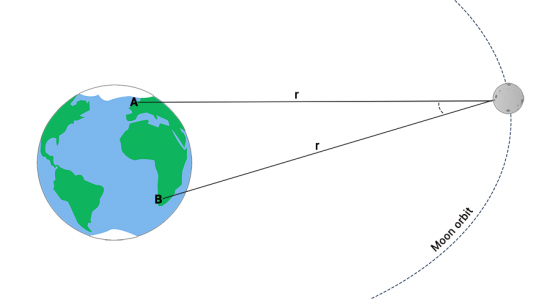 Interesting enough, the “lunar distance” measurement uses this Earth–Moon span. 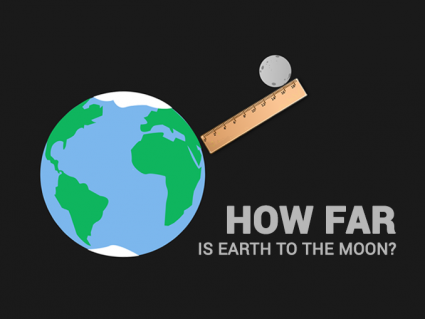 But how do we measure the distance between the Earth and the Moon? 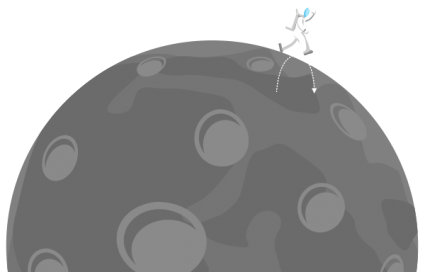 Over time, scientists have found new techniques to measure the distance from the moon to Earth. Each one, more accurate than the next. Find out more below. When the Apollo program (11, 14 & 15) astronauts visited the moon, they left retro-reflectors on the lunar surface. When they send a laser pulse to the moon, it reflects off the reflector and back to Earth. And the entire time this pulse is traveling, scientists count the time it takes for it to return. To put this into perspective, light travels at 300,000 km/s. It takes about a second for the light to travel to the moon. Then, it takes another second for it to return. Actually, only a handful of photons come back. So astronomers count how long it takes for those photons to make the journey to the moon. Currently, the Lunar Laser Ranging Experiments is the most reliable method to estimate the lunar distance. For example, it has exceeded millimeter accuracy involving multiple laser facilities. 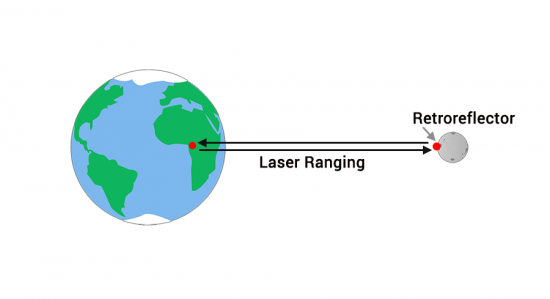 Similar to the Laser Ranging Experiments, radar sends a signal and measures how long that echo takes to return. If you know how fast the wave travels, then you can understand distance. In 1957, a US Naval Research Laboratory broadcasted radar pulses to determine the distance to the moon. After the pulse echoed off the moon, they measured the time it took for the return signal. However, the noise was so high that it couldn’t produce a reliable, repeatable measurements. One year later, this experiment was repeated by the Royal Radar Establishment, in England Using a longer pulse duration, the return echo estimated the moon’s distance as 384,402. Although this was the most accurate lunar distance estimate at the time, it had an error of ±1.2 km. 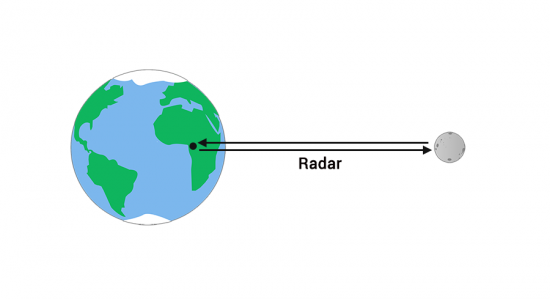 Astronomers have also estimated the Earth-Moon distance using parallax. For example, you can test out parallax by blinking your left and right eyes back and forth. When you do this, you gain two different vantage points to gain depth perception. From two different vantage points, both observers take a picture of the moon and compare stars in the background. Knowing the fixed distance between both reference points and orientation, parallax uses triangulation to estimate the distance to the moon based on its apparent shift in positions. You compare the distance change between both images and measure the parallax angle at two different reference points. With a bit of geometry, you can determine the moon’s distance from the parallax angle from the two views. Over 2000 years ago, the Greeks found the circumference of the Earth by looking deep into a well. Eratosthenes estimated the Earth’s diameter was approximately 8,000 miles. 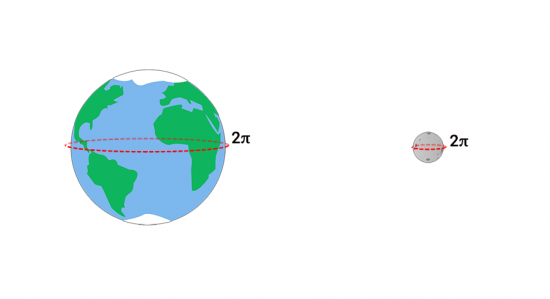 When you hold out a spherical object, Greeks also found through trial and error that a 1-inch diameter object casted a shadow with a length of 108 inches. So if you were to hold up a 1-inch sphere to shield the moon 108 inches away from the eye, it would perfectly block out the sun. During a lunar eclipse, the Earth shields the moon from the sun’s light. They observed that the Earth cast a full shadow on the moon equal to two and a half moon diameters. From here, they used the properties of isosceles triangles to formulate that the moon has a diameter of about 2300 miles. Remember how a 1-inch diameter sphere perfectly blocks the Earth at about 108 inches away from the eye? Finally, they multiplied 108 by 2300 miles to approximate the moon’s distance is about 248,000 miles away.